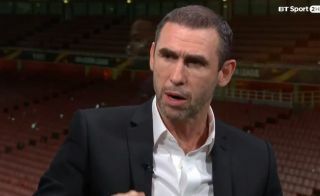 Martin Keown has been discussing Arsenal summer signing Bernd Leno and has raised question marks over whether or not the goalkeeper is good enough to displace Petr Cech. As per The Guardian, the Gunners splashed out around €22m to sign the German shot-stopper this past summer, with many assuming that he would replace Cech as Unai Emery’s first choice between the posts. That hasn’t played out, as the 26-year-old has yet to feature in the Premier League this season with Cech still being preferred by the Spanish tactician in the opening weeks of the campaign. Whether or not it’s a case of allowing his new recruit time to fully settle before pushing him out into the starting line-up remains to be seen, as a change should then likely be forthcoming after the international break. However, Keown has raised concern over whether or not Leno is fit for the job as he still has doubts over whether or not the former Bayer Leverkusen star is actually good enough as he isn’t being given an opportunity to prove his worth and quality. Time will tell if that opinion changes when he’s given a chance to impress in the line-up, and so perhaps with games against Vorskla and Brentford coming up later this month in the Europa League and League Cup respectively, it could give Arsenal fans their first glimpse of the German international in action. Until then, it is arguably a source of legitimate concern that he hasn’t done enough to push ahead of his 36-year-old teammate to make the starting berth his own already.